It is easier to write when you have a fully formed idea of what you are writing. Taking a little extra time to think about the details you write into a scene, character or dialogue can significantly enhance the story, and the word count (therefore making NaNoWriMo easier). Every writing class I have taken, including editing classes, have affected every manuscript to come after. An average of 1667 words a day is not always possible. I’ve worked out which days I can write more on, and aim high on those days. Some days I can only get a few words in, and on Tuesdays I write nothing. This is because it’s hard to fit it in, and because I want rest day. Getting up to have a 5 minute break IS helpful (I already knew this one, but wanted to share it with you). I often come back to the laptop and feel my fingers dance across the keys. It doesn’t matter how bad it is, you can edit later. 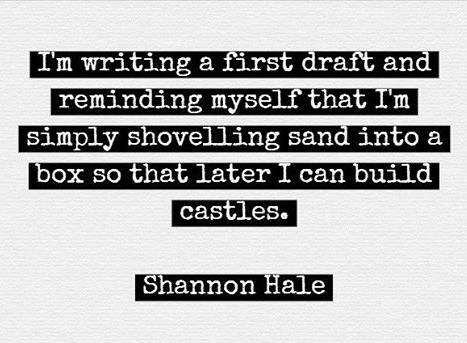 Whether you are participating in NaNoWriMo, or simply working on your manuscript, remember; you are only shovelling sand into a box to later build castles.